February, and sunset is now five o’clock and getting later – thank goodness. As soon as the sky starts to darken, look to the southwest and you can see Mars is still following us around. It is now no brighter than the first stars to appear, but its colour never fails to give it away. On the 10th, a crescent Moon is just underneath. Full moon, on the 19th, again finds the Moon very close to perigee and in fact, it is slightly closer to the Earth than it was for the eclipse last month. It is also as far away as it gets this year when it is new on the 4th but I can guarantee that this will make absolutely no difference to its appearance on this date. Indeed, if you are up and about around six in the morning you can see Jupiter and Venus climbing up from the southeast horizon. Later in the month Saturn starts to follow them and they are all joined by a crescent Moon on the 27th. Back to the evenings and this is the time of year when we see the real “stars” of the winter sky. They contain the full range of everything that it’s possible to see with the naked eye, from where stars are born to the oldest of all stars. First off, high in the south is the fuzzy patch of stars known as the Seven Sisters or the Pleiades. This is an easily-recognised little cluster of blue stars sitting in, or rather, in front of, a cloud of gas. They are that colour because they are very young and hence very hot indeed. They have probably recently condensed out of the very cloud that they illuminate. To the left and a little below is a very orange star. This is Aldebaran, which sits in a vee of stars forming Taurus the Bull and sometimes referred to as the Bull’s fiery eye. It is at the opposite end of its lifetime to the stars of Pleiades, being very old and approaching the end of its life, so has cooled and expanded into a red giant. It is also one of the closest stars to us at about 65 light years away. In fact, it is so near that a space probe launched 40 or so years ago, Pioneer 10, will pass close by – in two million years’ time! 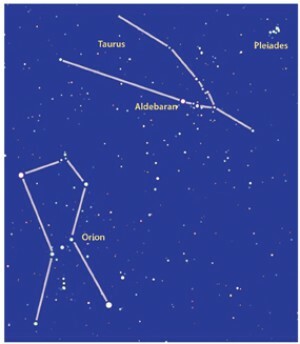 To the left and below Taurus is the king of the winter sky, Orion. This huge constellation dominates the southern sky and is, without doubt, the most impressive of all the visible star patterns. Finally, it is sad to report that the hoped-for launch of SpaceX Crew Dragon is delayed to this month at the earliest because of NASA‘s funding being frozen. This is due to US government in-fighting and indecision. Glad that sort of thing never happens here.